Vaccination involves a virus or bacteria being purposely introduced to an individual, usually through injection, in order for the person’s immune system to develop resistance to a specific disease. Vaccination is one of the most effective means of preventing infectious diseases and is responsible for the reduction of a number of diseases including measles and polio, and the complete eradication of small pox. As of 2016, an estimated 85 percent of one-year-olds worldwide had been vaccinated against measles, while Merck & Co., one of the largest pharmaceutical companies in the world, generated over 6.5 billion dollars in vaccine revenues in 2017. Vaccinations have accounted for a decrease in the number of annual cases of many diseases within the United States, such as Diphtheria, influenza, measles, mumps, rubella, and hepatitis A and B. Many children in the U.S. receive recommended vaccinations when they reach certain ages and many states require such vaccinations before children are allowed to enter public schools. In 2016, around 91 percent of all children aged 19 to 35 months had been vaccinated against measles, mumps and rubella. In most cases, vaccines have no side effects; however, like any medication certain unwanted effects may occur. In the United States, such complaints are filed under the National Vaccine Injury Compensation Program (VICP). From 1988 to 2018, 669 petitions were filed with the VICP seeking compensation for injuries caused by the hepatitis B vaccine; however compensation was awarded in only 267 cases. Such incidences result in a small minority of people refusing vaccinations for their children. 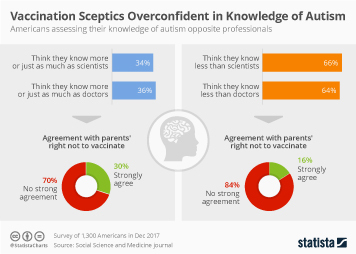 Health care professionals cited a fear of a connection between autism spectrum disorder and vaccinations as the number one reason families refused vaccines or requested alternative schedules, despite there being no evidence linking autism to any vaccination. As of 2017, around 19 percent of adults in the U.S. believed some vaccines caused autism, while just over half believed this to be false. The vaccine most likely to be refused by families, as reported by health care professionals in 2016, was for the human papillomavirus (HPV), despite HPV being the most common sexually transmitted infection in the United States. In 2017, it was estimated that around 69 percent of female adolescents had received at least one dose of the HPV vaccine, while around 63 percent of male adolescents had done so. More interesting topics from the industry "Prevention"